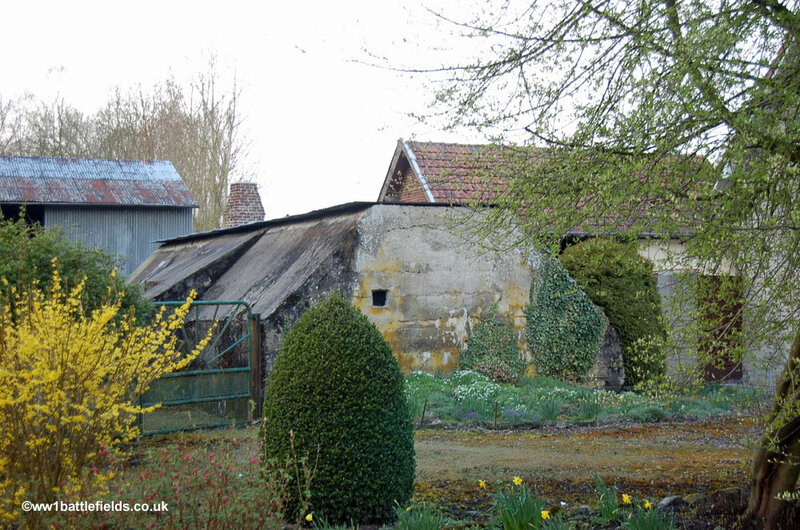 Festubert is known for the battle which was fought there in May, 1915. 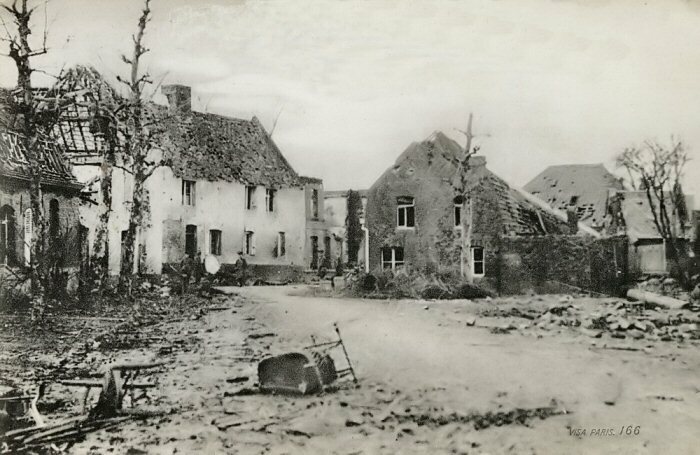 This followed shortly after that at Aubers Ridge, and commenced with a night attack just before midnight on the 15th of May. Over ten days the British made some small advances, but less than hoped. 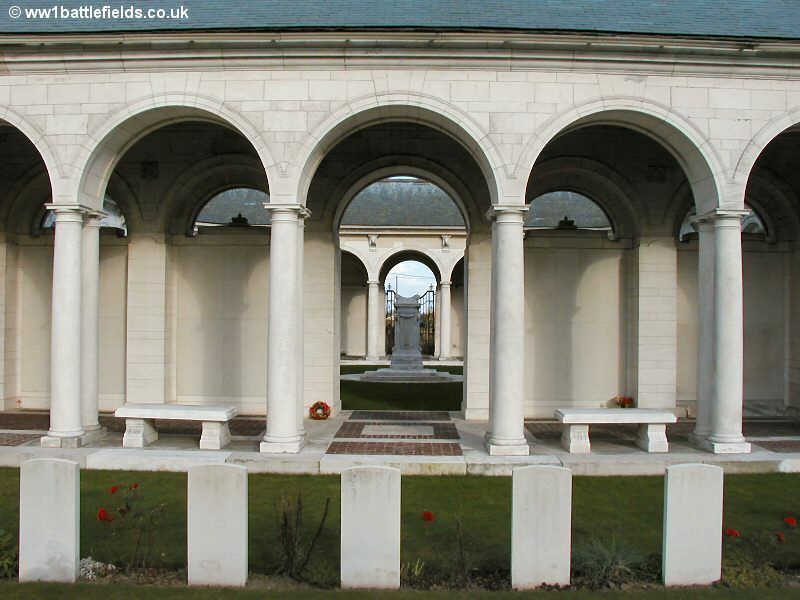 The attack was preceded by a bombardment that lasted longer than originally intended, but on the day of the attack the number of rounds fired over an equivalent front was actually slightly less than at Neuve Chapelle two months earlier. The need for munitions in Gallipolli has been blamed for this, and in fact on the day of the attack at Loos, a much larger attack four months later, there were even fewer artillery rounds fired per 1,000 yards of front. 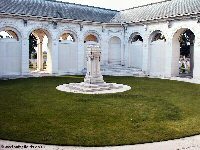 There are a number of sights to be seen in the area, and the first described is what I consider to be one of the most beautiful and moving of the Memorials to the Missing - that at Le Touret. The Le Touret Memorial to the Missing was constructed on the site of Le Touret Cemetery. The outlines of the memorial site follow exactly the outline of the original civilian cemetery that stood here. 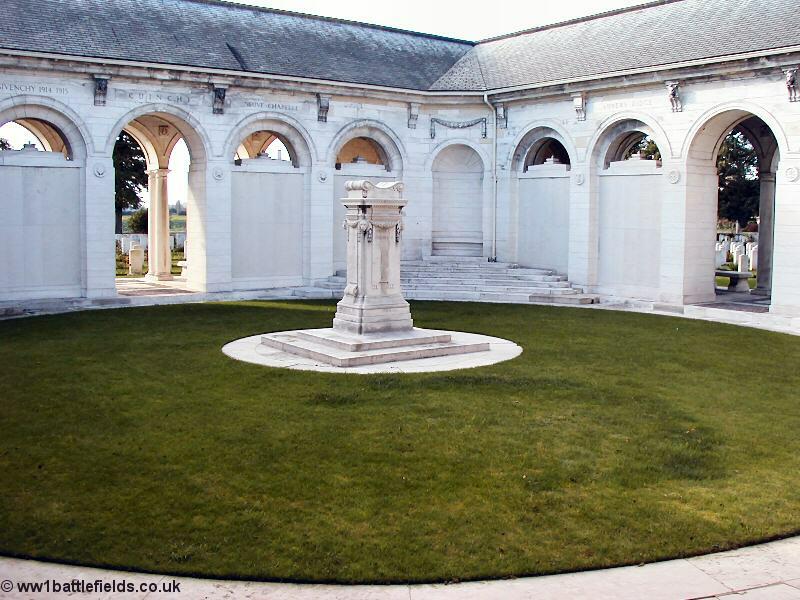 Most of the men who died at Neuve Chapelle and who have no known grave are commemorated here (except Indian soldiers, commemorated by the Indian Memorial at Neuve Chapelle). 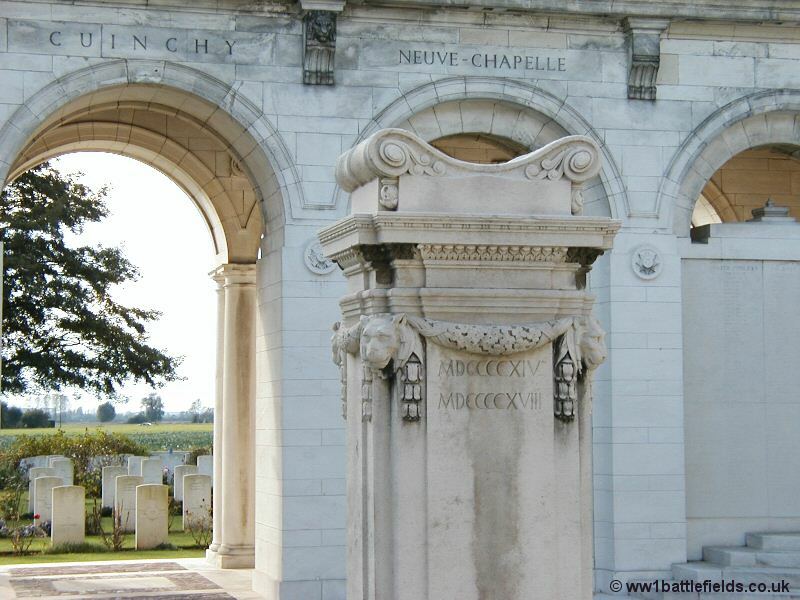 Le Touret is reached by following the road running west from the Indian Memorial at Neuve Chapelle (the D171). The Memorial is an impressive structure, consisting of a series of walkways which are lined with panels listing the names of the Missing on one side, and which are open with interspaced columns on the other side. 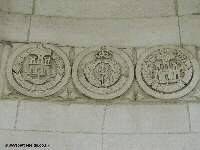 The Register at the Memorial states that 13,376 men from the United Kingdom, and one from India are commemorated here. A silver CWGC information board, however, gives the numbers as 13,373 UK and 2 Indian soldiers, and the CWGC website also lists 13,375 as the total. 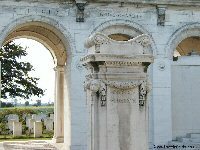 The memorial commemorates those with no known grave who died in the area from approximately the river Lys to the north and Grenay to the south, and who died between the arrival of II Corps in Flanders in 1914 and the 24th of September, 1915 (the eve of the Battle of Loos). 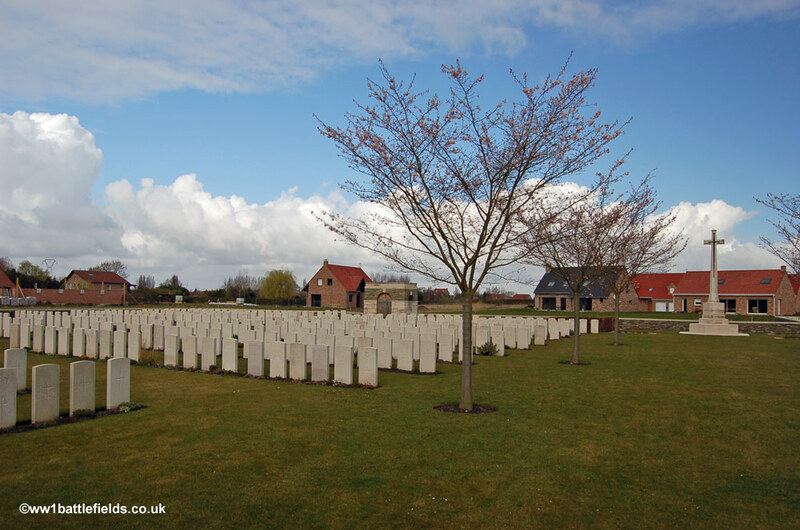 The cemetery was started by the 2/Leicesters in November 1914 and used until March 1918, when the ground here was lost to the Germans in their Spring Offensive. There are thus a wide range of dates of burial represented in the nine hundred graves here. 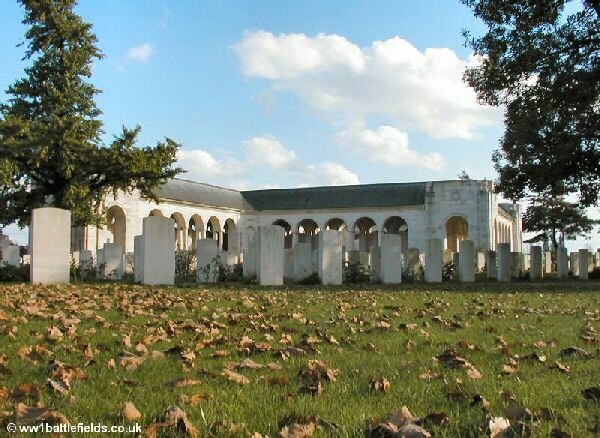 Many Portugese soldiers were originally also buried here, but after the Armistice they were removed to the Portugese Cemetery near Neuve Chapelle. In the centre of the memorial, between the walkways, is a grassed area "courtyard" area containing a stone column, with the dates 1914 - 1918 etched on it in Latin numerals. Inscribed above the arches in this courtyard are the names of the battles and actions fought in the area and over the time which this memorial covers. They are: La Bassee, Festubert 1914, Givenchy 1914/1915, Cuinchy, Neuve Chapelle, Aubers Ridge and Festubert 1915. 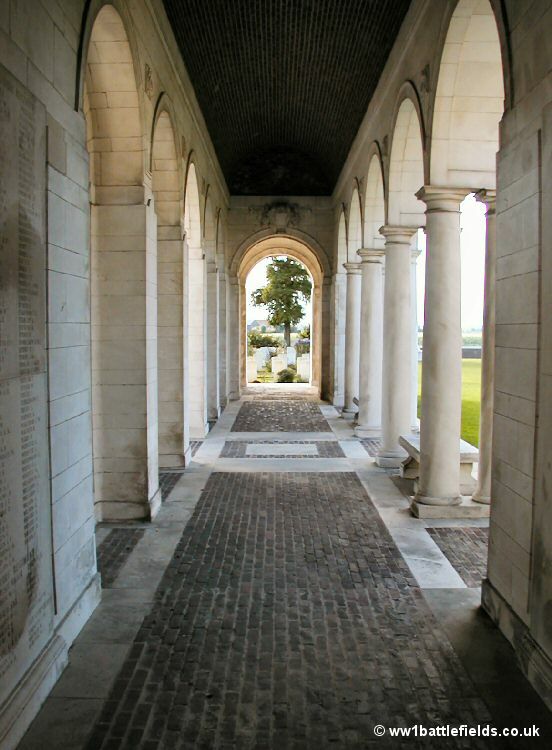 The inscription above the entrance to the memorial is in English and French, and reads "To the Glory of God and in memory of 13,482 British officers and Men who fell fighting in this neighbourhood from October 1914 to September 1915 whose names are here recorded but to whom the fortune of war denied the known and honoured burial given to their comrades in death". 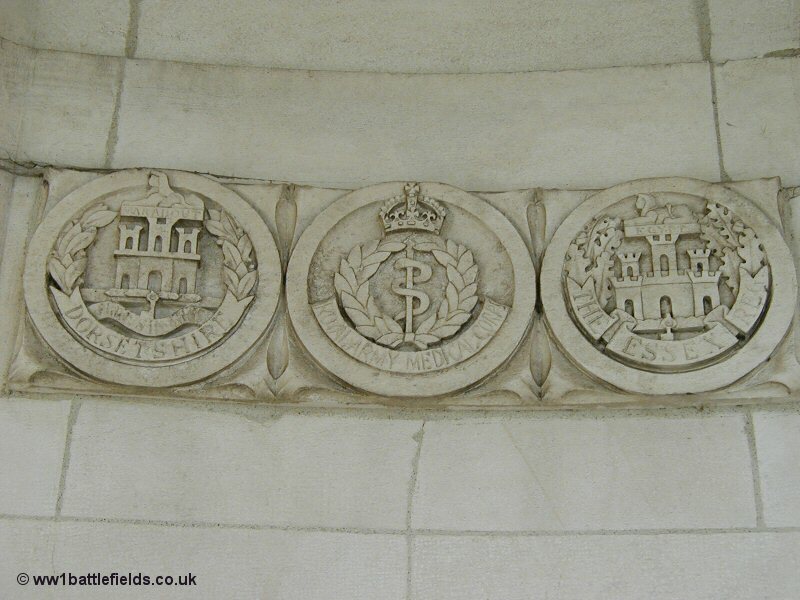 Above arches within the walkways, and elsewhere are engraved regimental insignia of the units whose men are commemorated here. An example is shown in the photograph below. The memorial was unveiled on May the 22nd, 1930. 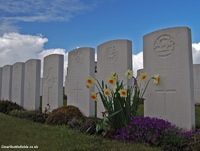 Lord Tyrrell, the British Ambassador to France at that time, performed the ceremony and spoke of the fact that all those from Britain who had fallen in France still lay in France: 'men of every class, of every rank from General to Private - all in graves marked, without distiction, by the simple headstone'. 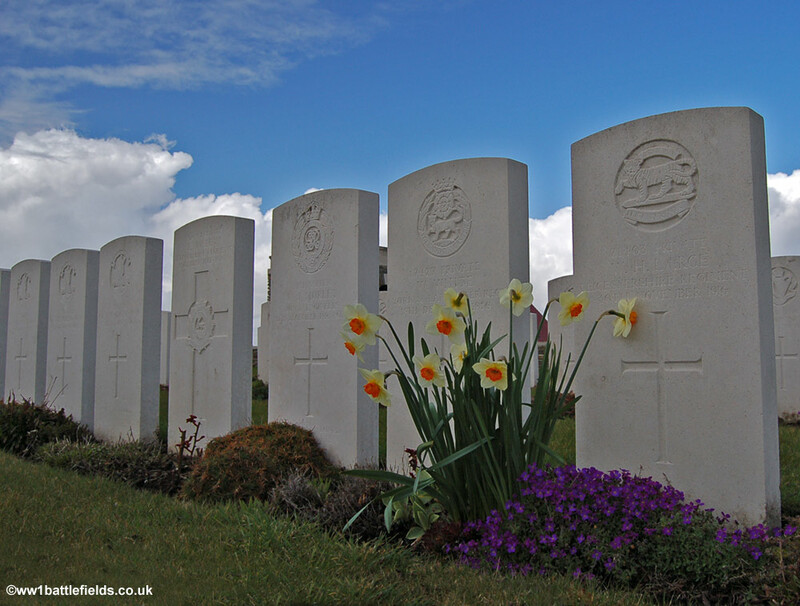 The use of a standard headstone rather than allowing the greiving relatives to choose their own design was one of the main controversies that the then Imperial War Graves Commission faced. 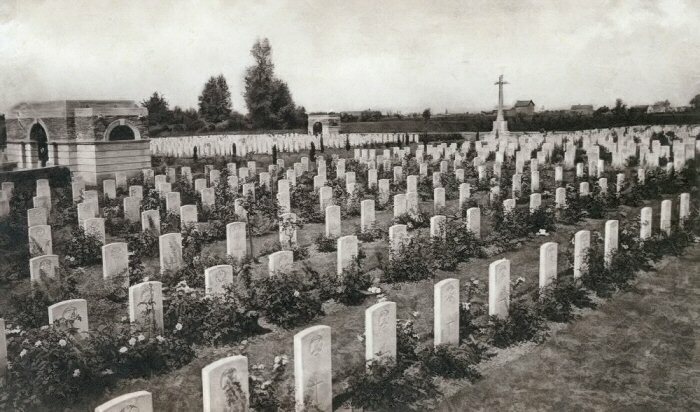 There were debates in Parliament and outcires from some relatives of the fallen; but the Commission felt strongly it would be unfair to allow the rich to choose perhaps more ostentatious or grand headstones, whilst the majority of famileies would not be able to afford to express their grief in a similar way. They stood firm, and they were right to do so. 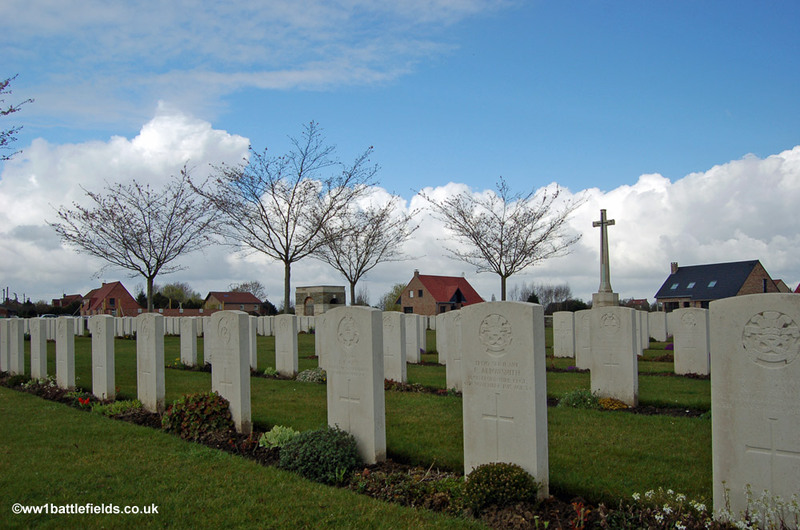 The appearance of CWGC cemeteries when compared to civil cemeteries with their profusion of different designs, sizes and types of headstones is one of simplicity and calm. Brown's Road Military Cemetery can be found on a small road leading to the west out of Festubert village. 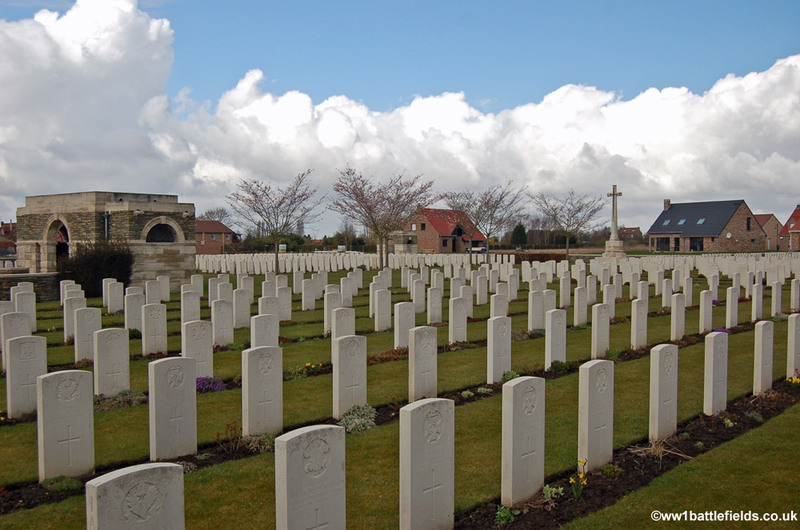 The cemetery was begun in October 1914, and used up until November 1917, when it contained nearly 300 graves. 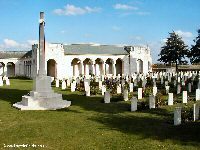 After the Armistice, other graves were brought here, and today there are just over a thousand burials, around 400 of which are unidentified. The cobbled entrance to the cemetery is sometimes used by local residents as a place to park their cars, particularly at the weekends, but this does not restrict access. 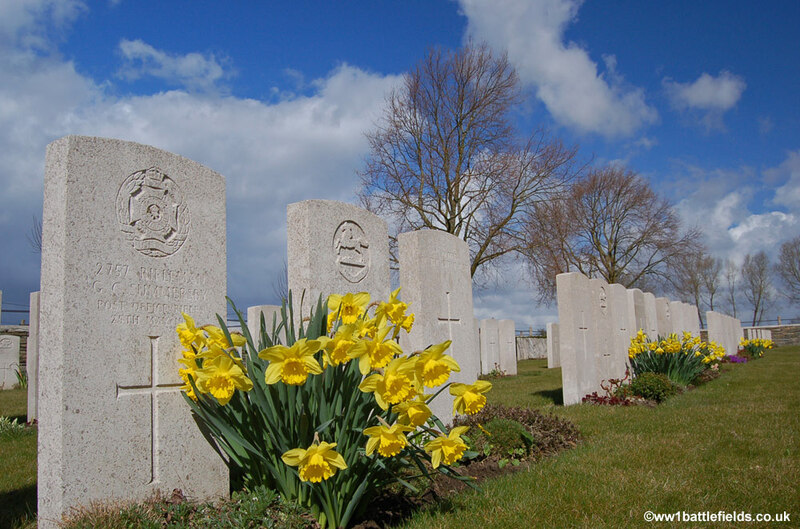 There are new houses around the cemetery, but again the CWGC gardeners have created fantastic floral displays here, as shown in the picture below. 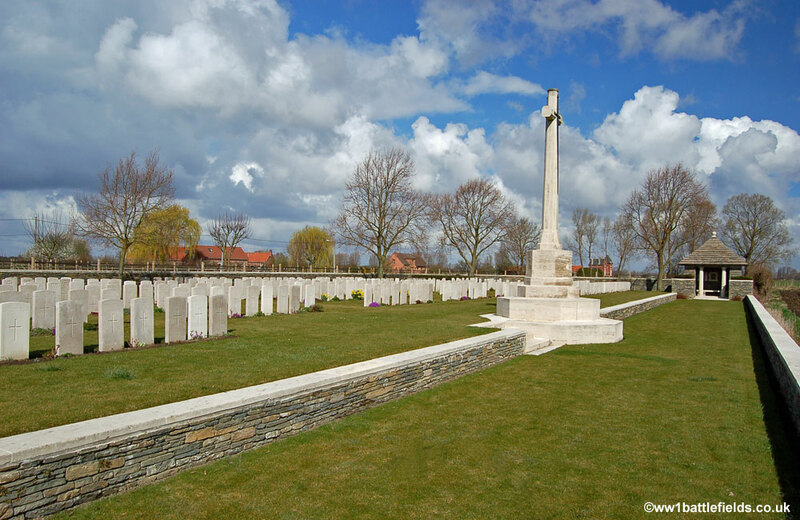 The Post Office Rifles Cemetery was originally used between April and June 1915, and contained just under 40 graves before the German advance in Spring 1918. 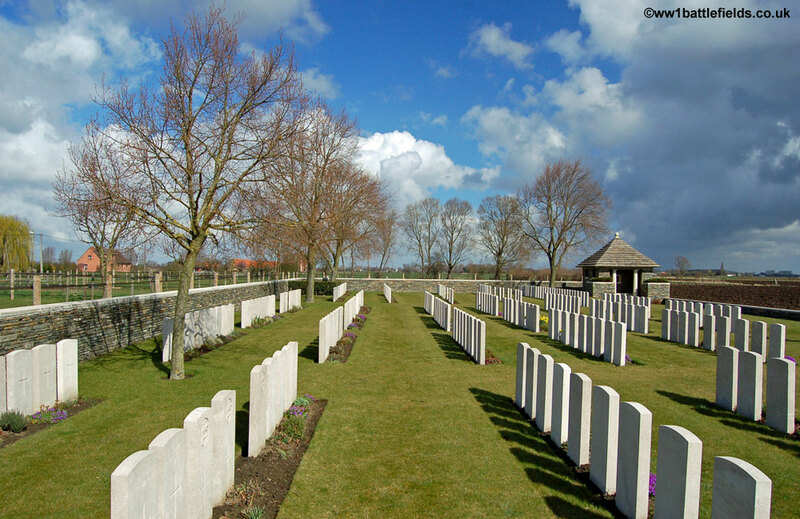 Like others it was severely damaged by shellfire during the offensive, and only six of the graves were left standing after March 1918; the remainder being in "waterlogged shell holes". 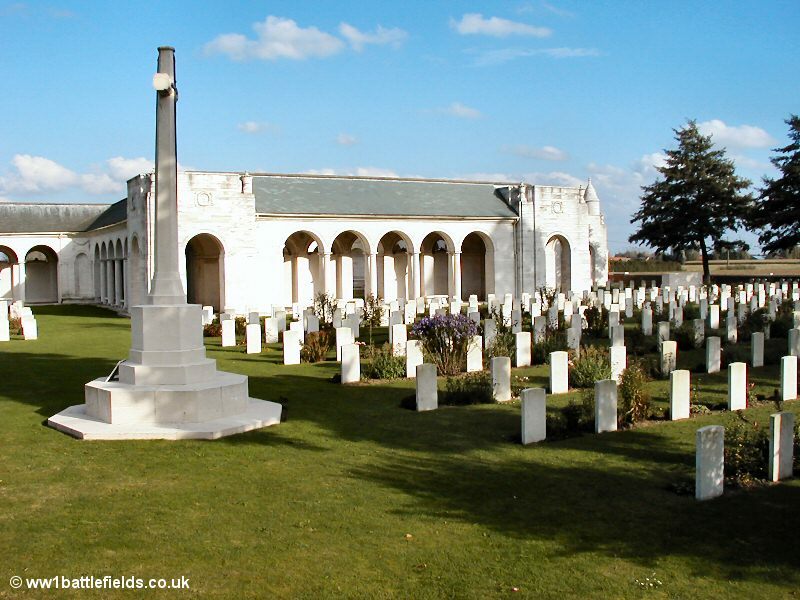 The graves were restored thanks to a survey that had been made prior to the advance, and after the Armistice the cemetery was used to concentrate other burials from the battlefields around the area. It now contains 400 burials. The register is located in a small building at the far end on the right side as you enter, reached by a lower tier lawned path, with the graves on a higher tier to the left. The Cross of Sacrifice stands by the steps leading up between these two levels. 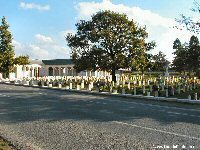 Plot 3 to the left as you enter the cemetery consists of almost all unknown soldiers. Plot 1, the furthest from the road, contains the original graves. The Times carried a story, ten years after the Armistice, of a case of mistaken identity of one of the fallen. 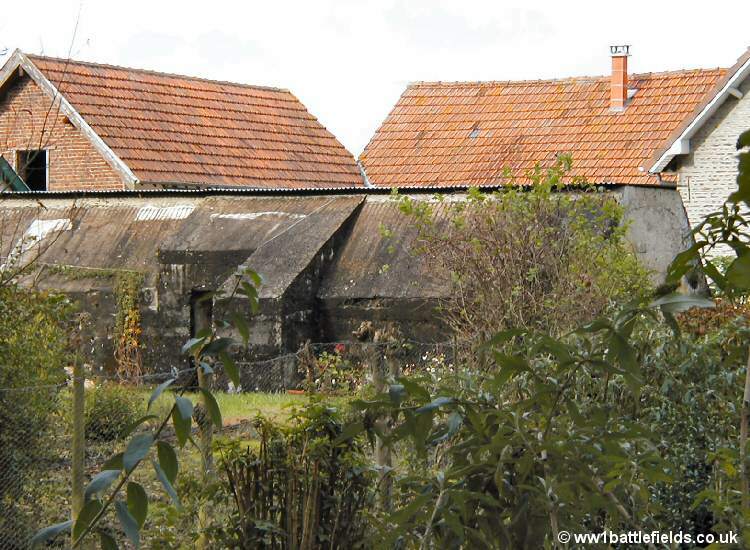 Two soldiers manning an Observation Post near Festubert were attacked by the enemy and one killed, whilst the other escaped. A letter was found on the body of the soldier who was killed, and from this his body was identified and buried. However, it later turned out the man identified had in fact survived the war. He had given his letter to his companion in the Observation Post to read, just before the German attack, and he had been the man who escaped. In the pressure of war the mistake (which he said had been realised shortly after the event) was not corrected until many years later. It should be clarified that the Times article does not give the names or state where the the man was buried. Not far from Browns Road Cemetery is a large bunker, known as the King's Post Bunker. It can be found by leaving the cemetery, going to the right along the road from it and taking the second left turn. The bunker is next to the last house on the right before this road becomes a track. 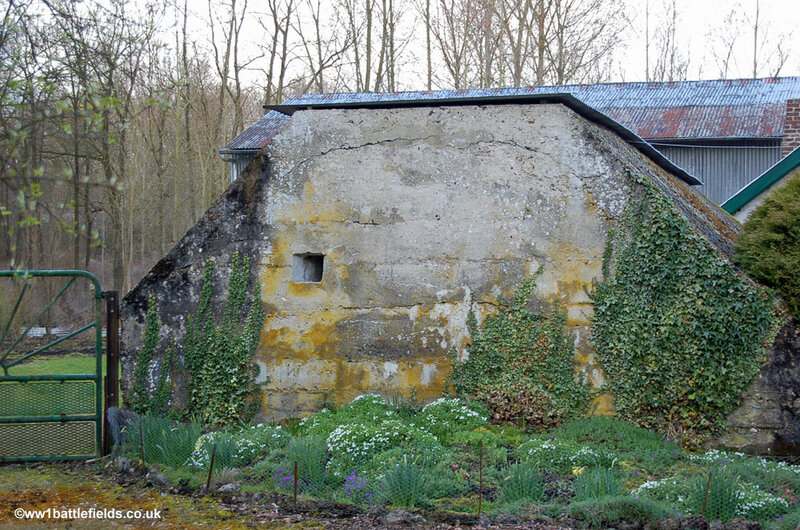 This is a bunker from much later in the war than the Festubert battle of 1915, and was probably a Brigade HQ in 1918.